AudioSlicer split MP3 files added to Audio directory. AudioSlicer is an application that finds all silences in an audio file and allows you to split it into several smaller audio files and to name/tag them properly. For now only MP3 is supported but other audio formats may be added in the future. 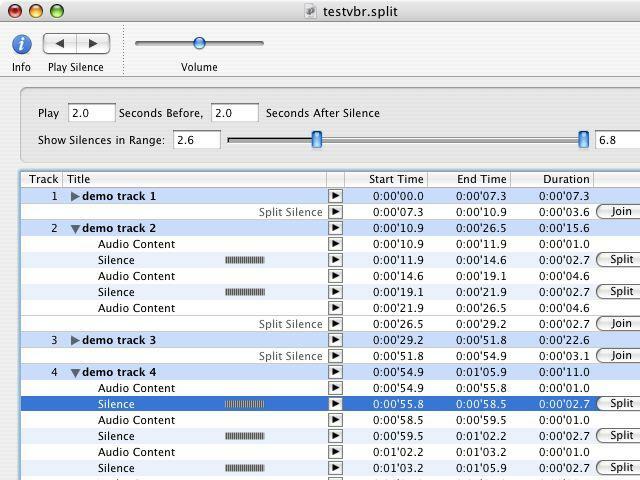 While most other tools doing this split automatically according to certain criteria, AudioSlicer shows you all silences within a certain range of duration. You can then listen to the silence - well, to the audio before and after the silence really - and then you decide if you want to split there. The splitting is done without loss, there is no decoding and re-encoding of audio data taking place.